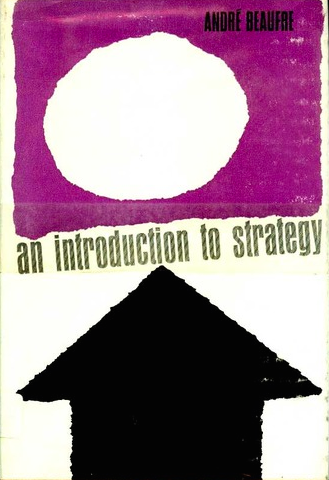 In his important work An Introduction to Strategy (1965), French General André Beaufre describes the purpose of strategy as achieving decision. According to Beaufre, “the decision is a psychological event that one wants to produce in the mind of their adversary”, in order to “convince him that starting or continuing the struggle is useless”. Beaufre’s work achieved fame because he admitted that the strategic decision could be achieved not just by military means, but also by economic, political, or diplomatic strategies. As for the military decision, it is the one that “in its purest state results from a victorious battle”. The capability of achieving military decision has varied throughout history, following what Beaufre calls the operational possibilities of the period, byproduct of the methods and means of warfare of each epoch. He then states that one “rarely attributes a just value to that variability”. In his work the six different phases of land operations are then explored, in order to illustrate the importance of that variability. The sixth phase describes land operations after World War Two. According to Beaufre, the increase in the cost of modern equipment and the expenses caused by nuclear armament were responsible for a large reduction the in volume of forces worldwide. This reduction, combined with an increase in tactical and strategic mobility created a dilemma about the use of forces: one could either disperse the forces through vast spaces to cover the entire front, or concentrate them in narrower surfaces to conserve combat power, although accepting gaps in the line of contact and unguarded flanks. This dilemma existed “by a lack of technical means that allowed a good surveillance in the vast fronts (…) that did not need important forces”. The existence of such technical means would allow the concentration of combat potential in critical points without leaving gaps and flanks unguarded. Technological evolution brought the answer to this dilemma. The digital revolution and the advent of Network-Centric Warfare produced an important change in the methods and means of warfare: the current use of unmanned systems, amongst other technological means allows the surveillance of the entire battlefield, allowing the concentration of combat power in critical points and lessening the dispersion of forces to guard the whole front. Can we then talk about a new paradigm, about a new phase of land operations, byproduct of the advent of unmanned systems and of the integration of information technologies on the battlefield? According to Beaufre, the evolution of the phases of land operations is commanded by the evolution of the “tactical factors”: offensive and defensive capability and tactical and strategic mobility. These are a consequence of the equipment, armament and procedures employed, so if the introduction of new methods and means of warfare significantly changes the tactical factors, on can talk about a new phase in land operations. As an example, Beaufre describes the introduction of the tank and mechanized forces: the tactical mobility of the attackers became comparable to the strategic mobility of the defender’s reserves, thus preventing the formation of static fronts (as it occurred in the beginning of World War One). Thus, the introduction of new means (tank) and methods (blitzkrieg) was responsible by the creation of a new paradigm in land operations. In the same fashion, the technological advancement product of the Digital Revolution is responsible for creating a new paradigm. Despite the fact that the offensive and defensive capabilities, as well as the tactical and strategic mobility remain mostly unchanged since the end of World War Two, one cannot analyze just the evolution of Beaufre’s tactical factors: today an analysis of the capabilities of a force requires analyzing what is the capability that that force has to collect intelligence or the capability that the commander has to control that force. If instead of Beafre’s tactical factors we use the “elements of combat power” – Movement and Maneuver, Fires, Protection, Intelligence, Sustainment, Command and Control, Leadership and Informations, as described in FM 3-0 – to analyze the capabilities of a force, an analysis of, for instance, the American forces in the First and Second Gulf Wars, that analysis would reveal a bigger evolution between the two conflicts than an analysis utilizing Beaufre’s factors, chiefly due to improvements in Command and Control, Intelligence, and Information that are not noted with the tactical factors. Unmanned systems are today part of the reason for the huge improvement of the capabilities of information and intelligence. The persistence and stealth associated with the employment of unmanned systems are responsible for this improvement, allowing for instance, the solution of Beaufre’s dilemma. The rising numbers of unmanned systems, linked to their diminishing production costs and their use by small units are current trends that contribute to the increase in combat power. Another current trend seems to be the employment of unmanned systems in high-risk missions. It is possible that the advantages gained by removing the crew of various weapons systems, such as tanks – on which removing the crew would mean a big reduction in weight – mean that in high-intensity scenarios, a progressive replacement of manned systems by unmanned systems may occur. That replacement brings with it ethical problems, though, than are not fully addressed today. So, the current impact of unmanned systems on the battlefield is part of the larger impact of the digital revolution, responsible for a change of paradigm in land operations. The fast technological advancement may lead to the employment of unmanned systems in other roles than the current roles of surveillance and attack, eventually replacing manned systems in high-intensity scenarios. That may produce a new paradigm change: the impact of unmanned systems is just starting to be felt.